MK Danny Danon says PM Binyamin Netanyahu won the vote on the leadership for the Likud party, promises to work together with him. 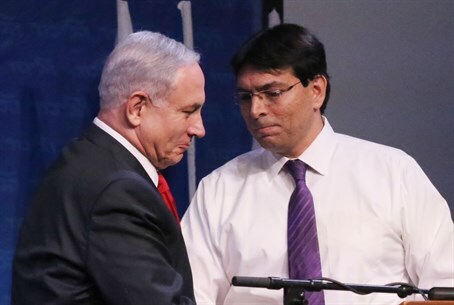 MK Danny Danon (Likud) a short time ago (Wednesday) conceded defeat to Prime Minister Binyamin Netanyahu in the vote on the leadership for the Likud party. “From the emerging results, Prime Minister Binyamin Netanyahu won the election,” Danon said in a statement. He added, "I congratulate the Prime Minister and wish him well. We will work together to bring the Likud to a victory in the general election." 55% of the Likud Central Committee members took part in Wednesday’s primaries. The members voted on three issues: The identity of the leader of the party, the party’s list for the general elections, and Netanyahu’s request to be allowed to reserve two spots on the party’s list for candidates of his choice. Official results are not expected before Thursday morning, due to the fact that the votes are being counted manually and not by computer. However, a count of the first ten ballots found that Netanyahu received an overwhelming majority of 85%. Danon indicated in an interview with Army Radio on Wednesday night that he conceded defeat to Netanyahu in the leadership race shortly after polls closed, because he saw the results of some of the ballots and concluded that Netanyahu was headed for a victory.